This week I learned how to interpret the discriminant. 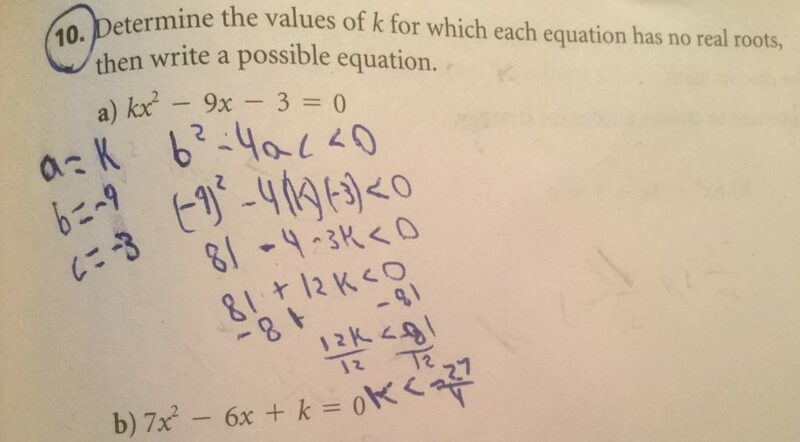 This question asked me to determine the values of k for which each equation has no real roots. The first thing you need to do is determine a formula for the discriminant which is the part of the equation in the quadratic formula under the radicand . You make the formula to less than zero because you want the discriminant to be negative, you can’t take a root of a negative number so the equation will have no real roots. Then you substitute a b and c into to the and use BEDMAS to solve for k. You figure out if k is less than there will be no answer to the equation because the discriminant is negative.